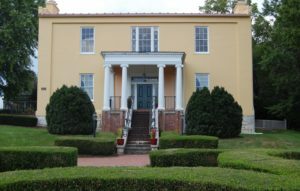 The yellowish brick home belonged to Lewis Washington, a great grand-nephew of the first president, on Oct. 16, 1859. He had boasted weeks earlier to one of the kidnappers about having one of George Washington’s ceremonial swords, and a collection of special pistols and rifles that he had gathered and invited the man to the house. While there a few days later, the soon-to-be kidnapper familiarized himself with not only with the weapons collection, but, more importantly, the layout of Beall-Air(e). The raiders took Washington, three of his slaves, a carriage and horses, setting out for more captive/hostages; being told that the next house they intended to hit contained too many women, the kidnappers continued across the rolling countryside to John Allstadt’s Ordinary [a tavern/restaurant for travellers] and house. He also was the toll collector for the turnpike about 100 yards from his front door and the quickest access to their fellow raiders at Harper’s Ferry. The ordinary is behind the house, although two stories it is about three-quarters the size of the residence. 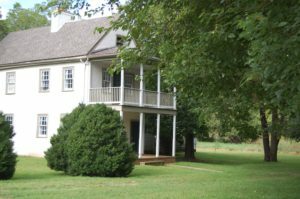 There inside the house at gunpoint, the raiders took Allstadt, one of his sons, seven slaves, a wagon, and its team of horses before setting out for Harper’s Ferry a few miles away. The Brown image is in the Kansas Capitol [Bleeding Kansas]. The book he is holding is the Bible. If the portrait had been done in Virginia, it likely would have reflected Brown’s holding his “constitution.” The constitution was for the Free State he intended to establish in the mountains of Virginia following the raid on the arsenal, to seize its weapons, and have the slaves from the nearby countryside join him. He had about a thousand two-edged pikes to arm them. Lieutenant Colonel Robert E. Lee, in most accounts, brought the captured constitution to Virginia Governor Henry Wise, who had rushed from Richmond with a trainload of troops — quickly sent back when the numbers of raiders were better known, to read as state officials, militia officers, and the curious gathered around the wounded Brown and at least one other badly wounded raider. Both were lying on the floor in the arsenal superintendent’s office. Lawyer Andrew Hunter transcribed Wise’s interrogation of Brown. Hunter, a close political ally of Wise, became the commonwealth’s special prosecutor in the Brown raid cases. The elected prosecutor was a drunk, full of himself and whiskey, and given to meandering, off-the-topic ramblings at trial. Wise, who was term-limited and was within ten weeks of leaving office, had presidential ambitions and was vying for the 1860 Democratic nomination when they party would convene in Charleston, South Carolina. He didn’t get the nomination — even when the party split between Stephen Douglas and John Breckinridge. Hunter won conviction in every Brown raider brought to trial in Jefferson County.